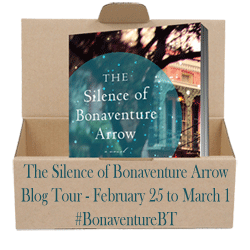 Welcome to The Silence of Bonaventure Arrow blog tour! When Harper Collins Canada invited me to participate, I was immediately intrigued by the comparison of this book to Jonathan Safran Foer’s Extremely Loud and Incredibly Close. While I haven’t read that book yet, the movie trailer never failed to move me to big, sloppy tears. So, on an emotional level, I was definitely intrigued by Bonaventure. Thank you to Harper Collins Canada for having me on this tour, and to my readers: the tour is just beginning. Lots of other stops coming up throughout the week (check out Savvy Reader for the schedule), and this afternoon, Literary Treats will be hosting a Q & A with author Rita Leganski! There are few treats better after a long week at work than a book that you can lose yourself in. 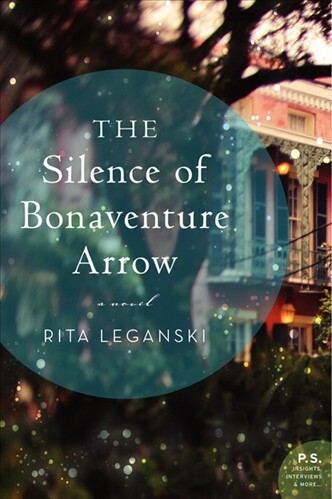 Rita Leganski’s The Silence of Bonaventure Arrow was that book for me. Leganski draws you into the world of 1950s New Orleans, where gris gris co-exists with Catholicism, the dead have a way of bringing secrets to light, and a special little boy has the power to heal his family. To be honest, there are a lot of things in this book that I wouldn’t normally like — an overtly earnest tone, talk of fate and destiny, religious overtones and an utterly precious, special child protagonist. Yet I ended up completely immersed in this novel, and a lot of that is due to the power of Leganski’s writing. Lovely and evocative, even when the author goes a bit too far with the lyricism, the language gently draws you into another world, and makes you believe in the magic. Bonaventure Arrow is unable to speak, but he is gifted with a super sense of hearing — not only can he hear people from other towns, but he can also hear objects speak of their history. His father William had died in a mysterious shooting incident before Bonaventure was born, and all he knows is that both his mother Dancy and his grandmother Letice have carried painful secrets within themselves ever since. With the guidance of his father’s spirit, as well as a hoodoo practitioner Trinidad, also gifted with a sense of Knowing, Bonaventure is destined to use his gifts to help his mother and grandmother heal. At its heart, Silence is about grief, about dealing with the death of a loved one under mysterious circumstances and finding the strength to move on with your life. It’s about forgiveness, faith and the intense love required to finally let go. William, for example, is unable to get past Almost Heaven and so stays with his son, the only one who can hear him. William’s struggle to come to terms with his own death mirrors Dancy’s struggle to do the same. Their love story continues, even past the point when both should be moving on, and the harshness of that reality is heartbreaking. Despite the magical tone and timeless feel, Leganski includes some elements that firmly set this book in reality. For example, Bonaventure is ostracized, even bullied, at school for his perceived oddness. Bonaventure is not quite as developed a character as his family members, but this little bit, along with his sudden anxiety about going to school and both his mother and father trying in different ways to help him out, really flesh him out as a character. This detail make him seem more like a flesh and blood little boy rather than just a mystical means by which his family can achieve healing. In another scene, Trinidad is treated rudely at the post office, and wonders if she’d accidentally stepped into a whites only establishment. Up till that point, I’d almost forgotten we were in the 1950s — we’d had subplots about social classes and explanations about various belief systems, and yet it was that reference to institutionalized racism that grounded the novel for me in a specific time period. Finally, I was most intrigued by the interplay between Catholicism and hoodoo (as opposed to voodoo) spirituality. I generally assume the two to be utterly incompatible, and indeed Letice does mention that she wants Bonaventure raised Catholic and therefore not exposed to anything related to hoodoo. Yet Trinidad at least appears to see no conflict between the two, and the combination of both is presented as being the most powerful option. It’s a fascinating decision on the part of the author, and one that I look forward to asking her about. The Silence of Bonaventure Arrow is a lovely book, one that welcomes the reader into a state of quiet, where words can work their magic. Check out the rest of the Silence of Bonaventure Arrow blog tour! Complete list on the Savvy Reader website. Win a copy of The Silence of Bonaventure Arrow – click here! Stay tuned for my Q & A with author Rita Leganski this afternoon at 1 pm! Thank you to Harper Collins Canada for an advance reading copy of this book in exchange for an honest review. This entry was posted in Book Reviews and tagged 50BookPledge2013, ARC, Blog tour, Fiction, Harper Collins, Historical by Jaclyn. Bookmark the permalink. The book sounds really interesting. Right up my alley! If I could enhance one of my senses to superhero heights, it would be… sight, I suppose, to avoid all the squinting and to see far distances crystal clear. That would be nice! I added this book to my TBR list as soon as I heard about it. Reading your review just makes me want to read it sooner!! If I could heighten any of my senses it would be my sense of sight. I think it would be great to not have to wear glasses and it would also be the easiest one to be able to take a break from (closing your eyes). It would be hard to sleep if you had a heightened sense of sound and there are too many stinky smells in the world. I would love to have my eyesight enhanced because I’ve always been very short sighted and it has limited what I can do for most of my life. I would choose to enhance my vision so I am more aware of things around me. I would definitely choose my eyesight. I’ve always had terrible eyesight! There is such beauty in this world and it would be great to actually see it all. I’d like to enhance my sense of sight, and with that, my ability to observe the world around me. I think we don’t see nearly as much as we could! Thanks for a nicely written review!